In a tradition that dates back over fifty years, Disneyland played host to the two collegiate teams that will compete in one of the biggest bowl games: the Rose Bowl. 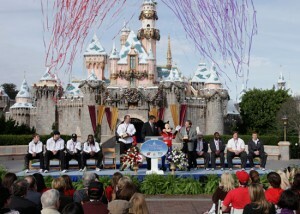 Members of the University of Wisconsin Badgers joined players from Texas Christian University’s Horned Frogs in a brief ceremony on Sunday, held in front of Sleeping Beauty’s Castle. Each team received crystal replicas of the Disneyland landmark to commemorate the occasion, before heading out to have some fun on the park’s rides. Disneyland has been associated with the Rose Bowl since its opening in 1959, and has hosted many teams who have met there.